ABUJA- Herdsmen, under the auspices of Myetti Allah Cattle Breeders Association of Nigeria, MACBAN, Nasarawa State Chapter, have said that they have realized the benefits of cattle ranching and ready to embrace it. This was disclosed by the coordinator, MACBAN, Nasarawa State Chapter who also doubles as Sarkin Yaki, Gaate of Gaate community, Kokona Local Government Area of Nasarawa State, Farmrade Retson Tedheke, who expressed excitement over the practical training they have received from an agribusiness firm. The firm operates, in the community, a cattle ranch and crop farming on over 3, 000 hectares of land. Tedheke, with the realization and enthusiasm, revealed that with the proper management of proper cropping and animal husbandry system, that there will be peaceful co-existence as everything within the farming environment is useful for both farmers and herders who are into ranching, as they benefit from each other in terms of utilization of waste from farms as feeds and in return, cattle dungs as manure for the crops. 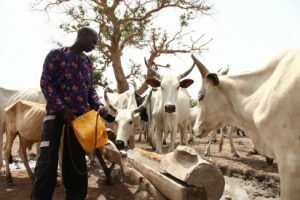 It would be recalled that the Federal Government, about three years ago, came up with ranching as solution to curb the incessant bloody clashes between herdsmen and farmers across the country, which some states including Nasarawa volunteered to give some hectares of land for the take off cattle ranches. The ranches are where the government will build settlements for herders including provision of some basic amenities to support and sustain the development as a way to address and arrest open grazing that has led to serious debates on the move by the government. He said: “As you can see, our cattle are looking fresh, healthy and in less than two years, we will have system that is all encompasses in animal husbandry. You are not just taking the waste from the farm to feed the cattle but you can as well use their dung as direct organic manure and in the future, we can use them to create renewable energy. “From what we are doing, we have not been able to provide jobs but we have been able to bring the Fulani community around together and they are learning from what we are doing here. “We have been able to take in the Fulani, used their experience and created a harmonious relationship between the Fulani and the community and also the Fulani are beginning to understand that if you treat your cattle this way, you are going to have better milk yield and healthy meat for consumption in the case of beef.